How best to get more visitors to your site? It’s a problem that never quite goes away. The internet is riddled with shady communities full of snake-oil salesmen busy peddling techniques “guaranteed” to make your website go viral with little to no effort. The real “secret technique” is simple – consistently deliver high-quality service and killer content that engages your audience. There are however some genuinely useful tactics you can use to turbo-charge your traffic, and running tightly organized contests is at the top of that list. In this article, we’ll walk you through seven of the best contest plugins for WordPress. Let’s kick things off with a look at just why this is such a powerful traffic-building tactic. Contests tap into powerful human emotions; they inspire a natural sense of urgency to get in before the deadline expires, hold out hope of a windfall of some sort, and introduce delicious anticipation as the entrants wait for news of the winner. To put it even more simply, everyone wants the chance to get stuff for free – give them the opportunity and most people will bite. Most online contests are focused around social interaction these days, a smart choice if you’re looking to increase the visibility of your website or brand. Not convinced that such contests can drive meaningful real-world results? Check out this compelling list of Facebook giveaways case studies. The prizes on offer don’t have to be enormous either. What you’re looking for is an offer that truly resonates with your audience and has a potential social sharing component. Something as simple as giving away a particular book or product could be enough to drive genuine interest. If you’re looking for a further, in-depth breakdown, check out Matthew Barby’s excellent overview of how to go about running an online competition. For the purposes of this article, we’ll be concentrating on our seven favorite plugin solutions for handling this via WordPress (plus some tips to make sure you make the most out of them). Let’s start things off with a simple option. The Pick Giveaway Winner plugin enables you to create a giveaway option on any WordPress post and helps you pick a random winner randomly from those who comment. It’s a no-frills, basic way of running a quick contest to get started with. Uses the MySQL RAND() function to pick the winners. Can automatically reject contestants who enter more than once, or merge their entries. Multiple entries can also be permitted. Identifies contestants via their emails. Specify a particular amount of possible winners. 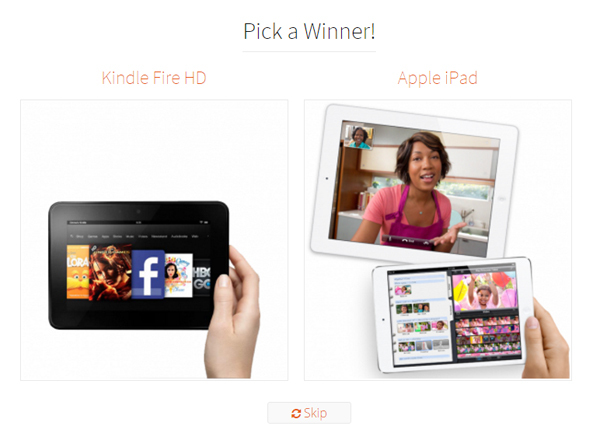 Use the “Pick winners!” function to end the contest when you’re ready. The ContestFriend plugin is more socially themed and designed around the opportunity for contestants to increase their chances of winning by sharing contests with their friends. You’ve got options to set contest duration at the outset, and controls for keeping tabs on how your contest is performing in terms of numbers of participants throughout. Along with attracting traffic to your site, ContestFriend also places an emphasis on growing your email list virally via integrations with MailChimp, AWeber, CampaignMonitor and GetResponse. 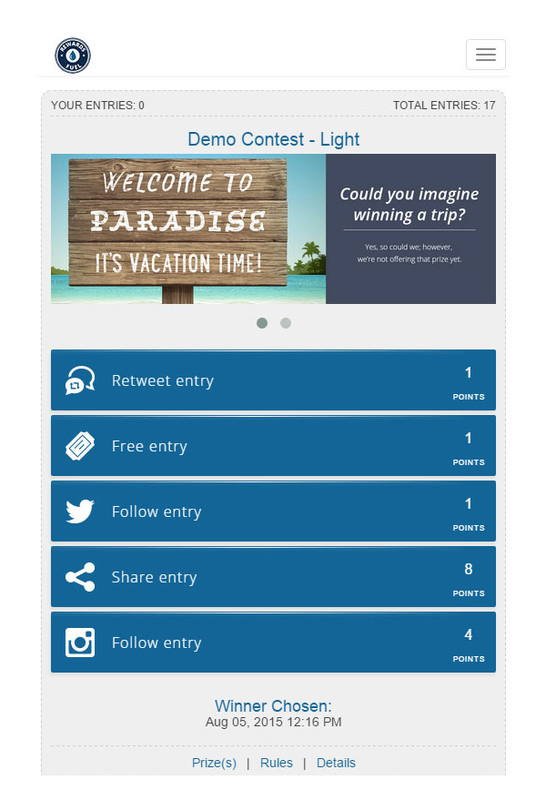 ContestTheme has sharing features for Facebook, Twitter, Pinterest, LinkedIn and Google+. You can manually modify the number of entries rewarded to participants for each of their shares. Take advantage of a solid range of customization options for contests: unique headlines, custom media, and multiple layout options are all supported. Use the email verification function to confirm the identity of contestants. Email lists can be exported to Excel. The number of potential winners can be specified in advance. The Photo Contest WordPress plugin is a commercial offering and priced at $41 with an online demo available. If photography is your thing and you want to set up a specialized contest to reward users willing to share their work publicly, this plugin is the one for you. Our options until now have covered chance-based contests, but skill-based competitions are an equally valid way of driving more visits and leads. Organizing a photo contest is pleasantly straightforward with this plugin. Simply install, visit the relevant tab in the admin, set your duration, rules, and prizes and you’re good to go. Select between open voting (all site visitors are allowed to take part) or limiting voting to participants. Social sharing is possible via Facebook, Twitter, Pinterest, Google+ and Tumblr. You can limit the number of entries per contestant. The entries gallery can be easily customized. Option to show a leader board with the top entries. You have the option of reviewing each submission before it’s included in the contest in order to enforce competition guidelines. Contestants can register via their Facebook, Twitter or Google+ profiles. Internationalization options are possible – the plugin is available in English, Czech, Dutch, German and French. The basic Contests by Rewards Fuel plugin is free and integrates with the wider Rewards Fuel offering. Premium versions are available in the shape of blogger packages at $7.95 and $13.95 respectively. This plugin takes advantage of social sharing to encourage your contest to go viral. Depending on the guidelines you set up, users can increase their chances of winning by performing different tasks on social media such as using a specific tag on Instagram, following a Twitter account, or sharing a link via Facebook. In order to start using the plugin, you must register on the Rewards Fuel platform, where you can opt for the free tier or the paid alternatives. It’s worth pointing out that this is a relatively new plugin on WordPress.org with comparatively few reviews, ratings or downloads so far. It’s a solid looking solution but you may want to kick its tires on a test site first before looking to integrate on live. Contestants can submit entries by commenting but also have the option of entering your competition by performing other social activities. Options you can target include Instagram tagging, Instagram following, Twitter follows or re-tweets, visiting a link, Facebook event joining and more. You get access to detailed statistics about contestants with demographic and location info powered by Google Analytics. 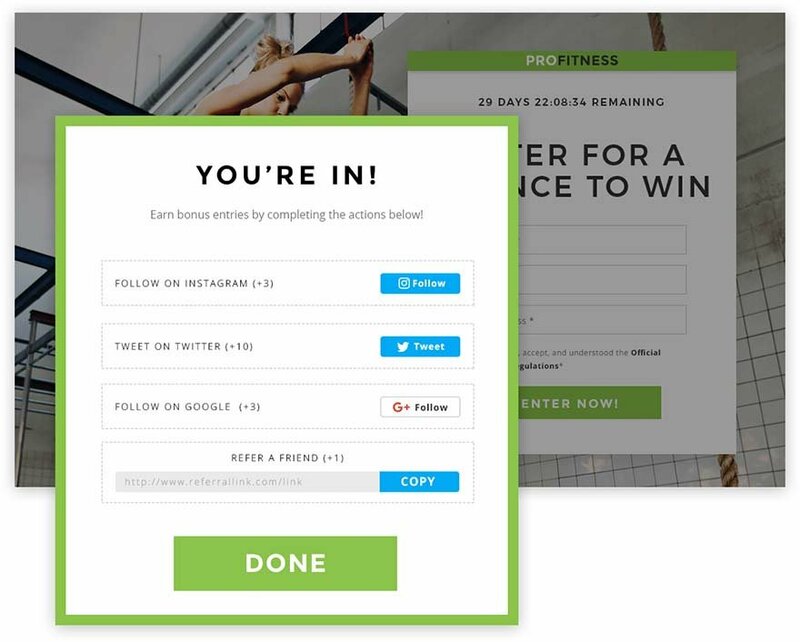 You can choose to automate contests entirely via a built-in scheduling function. Automate contests entirely through a scheduling function. Contests can also be hosted directly on the Rewards Fuel platform if you don’t have a WordPress site set up – an unlikely scenario but nice to have all the same. Unlimited entries (the basic plugin limits you to 100 contestants on any given event). Include contestants in your mailing list with MailChimp and Aweber integration. Create your own custom terms and conditions. The Showdown contest plugin is a premium offering priced at $23. If you’re looking for a unique spin on your competitions, this plugin allows you to hold image battles (similar to Photo Contest), basic popularity and custom content contests. One slight snag is that it’s only designed to help you host the contests themselves, so prizewinners have to be notified manually rather automatically via the plugin. Showdown enables group-versus-group contests in addition to the standard individual-versus-individual option. Select between Yes/No voting or numerical rating for popularity contests. Easily set the duration of each contest. You have the option of enabling a leaderboard to show the most popular entries at any time. Wishpond Social Contests is a free WordPress plugin with premium packages available for the Wishpond contests platform. It’s an all-in-one solution for running sweepstakes, promotions and contests (along with wider marketing services). Wishpond doesn’t reinvent the wheel with their offering, but they do offer a few interesting extra tools such as in-depth analytics, and split-testing of contest variations to let you hone in on what’s resonating with users. Now for the bad part: Wishpond is one of two plugins we’ll be covering in this list whose WordPress.org ratings aren’t stellar. Simply put, the plugin’s free version is severely limited, but this isn’t specified until you’ve already installed it. We’d advise checking the other plugins we’ve suggested thoroughly first before weighing up whether Wishpond is right for you. The premium features available are impressive, but you may be just as well covered by other options on our list. Contestants can use social media sharing buttons in order to increase their “votes”. Choose single or multiple winners. Drag-and-drop page builder for your competitions with multiple templates. Notifications of new leads sent to your email. Wishpond can send email reminders to contestants if you choose to enable this option. Run custom competitions such as sweepstakes, photo contests, Instagram hash contests, essay battles, caption competitions and more. 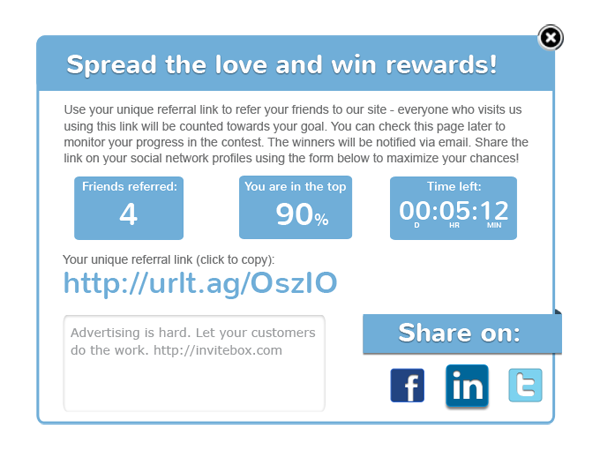 The WordPress InviteBox plugin does only one thing, but it does it well: drive referrals. This premium plugin is available in three plans: Startup ($19), Small Business ($59) and Unlimited ($199). You can set up instant rewards systems for your users after successful registrations of their friends, goal-based prizes and, most importantly for our purposes here, referral contests. The bad part: remember how we mentioned there was a second plugin with not-so-good reviews on our list? This is it. The developer doesn’t make any sort of mention of the plugin being paid-only in their WordPress.org page, which naturally angered some users. They do, however, offer a 14-day trial for you to check out the plugin before deciding whether to commit to one of their plans. Have you already tried running a contest or giveaway and been disappointed with the results? Or are you a bit nervous about pulling the trigger on your first one? A tempting prize goes a long way in getting people to flock to your campaign – that much is always true – but there are a few simple rules you should keep in mind to get the most from your efforts. We’ll cover three of them here. Yes, giveaways are a powerful tool but – before you throw away your life’s savings on a fancy gadget for your winners – you must carefully consider the type of visitors you’re hoping to attract. If it’s sales or subscriptions you’re after, you want people with clear buying intent. If it’s a brand-building effort, you need to be certain you’re zoning in on people with an existing interest in your area. Fail to get specific and you’d be better off burning your money to keep warm rather than wasting it on running random, untargeted contests. Once you’ve got your demographic in mind, find prizes that will be especially valuable for them. For example, if you’re running a photo contest, offering an expensive camera might cast too wide of a net. A free portfolio site or specialized lessons could attract a more selective crowd. By taking the time to target your contests properly, you’ll be ensuring a better return on your investment and an increase in traffic that won’t plummet back to nothing once the gift-giving season is over. If you’ve got the demographics dialed in, targeting emails is the next logical next step. A contest gives you permission to talk with an entrant a couple of times at best, a newsletter sign-up gives you permission to talk to them for months and possibly years. Asking for an email address is essential for running most types of contests but that, of course, doesn’t give you permission to repeatedly pester the person or use their email in any context outside the competition. You want to be sure you’re tying things together via integration with a permission-based newsletter provider of your choice. AWeber, MailChimp, and Get Response are all excellent options and integrate easily with several of the plugins we covered. The Photo Contest plugin we mentioned earlier is a perfect example of what a skill-based contest should look like. They aren’t perfect for every situation – and aren’t necessarily as prone to go viral as good old-fashioned giveaways – but, by forcing contestants to actually make some effort to join a contest, you increase their level of personal investment in proceedings. This can boost their overall engagement with the competition and, if you’re following up on social as you should be, can be a great way to get real conversations going with your audience. By now you’re aware of the power of contests to boost the popularity of your site and fatten up your prospect list. You’ve also got a solid set of tools to choose from in terms of integrating contest offerings with your WordPress website. Always tie competitions in with growing your email list. Consider using skill-based contests to really engage with your audience. With the right tools for the job and a bit of solid, common-sense preparation, the ultimate winner of any contests you offer will be you. They’re hard to beat as a simple way of brand-building and targeting prospects and customers for your business. Have you tried your hand at running contests or giveaways in the past? Got any experiences or tips to share? Get in touch via the comments. Simply awesome. Got some great information . Going to run a giveaway program on my website by using wishpond plug inn. Awesome, I think I asked for it a couple of posts ago and you really delivered! You left out ContestBurner which is very good and has a ton of useful features, training, and facebook page integration (among others). It’s a bit like Wishpond, but doesn’t charge based on contacts, it’s a flat monthly rate. I would also stick with Gravity Forms Polls. It certainly gives you more customized options. Have you guys any other plugins for giveaways like KingSumo? The article is great, thanks! Can I use these plugins only for wordpress or other platforms too? I’ve been using Wishpond and getting great results. Afraid to try anything else and take a wrong step backwards. Do any of these plugins handle video contests? Awesome post as always. Thanks for sharing. can you suggest any plugin for auto sending post in email to subscribers? Thanks, great inspiration! I would really appreciate more inspiration for good and tested skill-based competitions like puzzles, jackpot, scratch cards etc. Could anyone provide that? Is it not against FB regulations to “force” someone to share your content in order to be eligible for entry to your competition?